Tony Harvey-Bacon mentions his near-death experience in news article “It wasn’t that I was scared of dying. I ‘died’ in 1974 in a motorbike accident in Burton. I hovered above the scene and was looking down at my body and the bike in the road and then I was aware of people behind me saying it wasn’t my time, and I went back. Tony Harvey-Bacon with business partner Ian Page. Reported in [burtonmail.co.uk] on April 21, 2012 Tony is a web wonder - against all the odds. 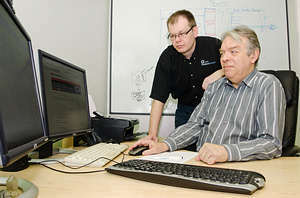 The launch of Burton IT business, Webb2b, is being celebrated today by businessmen Ian Page and Tony Harvey- Bacon. But two years ago this launch seemed an impossible dream when Tony was diagnosed with two critical illnesses. Elaine Pritchard learns more about his remarkable story. For a man who was given three months to live in January 2010, web expert Tony Harvey- Bacon looks remarkably healthy and cheerful two years on in the Burton offices of his new business. The 27 months since his devastating diagnosis are described by Tony as: “A wonderful journey — one I wouldn’t have missed for the world. I have been reborn”. At his lowest point Tony was confined to a wheelchair and his friends and family prepared to say goodbye as he appeared to be losing the battle against a devastating combination of multiple myeloma (cancer of the plasma cells) and amyloidosis, which sees the body produce abnormal protein cells which latch on to organs, causing major damage. 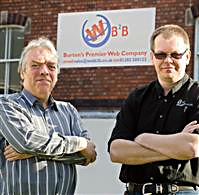 Now, having fought for life against all the odds, he is embarking on the exciting adventure of his new business Webb2b, in partnership with Ian Page, of Burton computer company PC Problem, who has led the campaign for high-speed broadband for the town. From offices above Phillips the Florist, on the corner of Uxbridge Street, Webb2b is providing IT and web services to businesses in and around Burton. “I would love it if my story gave hope and inspiration to people living with cancer and other would-be entrepreneurs,” said Tony. Burton born and bred, Tony was a tool maker and engineer by trade who moved into computer work in the early 1980s. He also worked as an IT and quality manager, taught at Burton College and Queen Street Community Centre and was a parish councillor. In 1999 he went self-employed but said lifelong chronic depression — which he skilfully hid from the world — coupled with the stress of taking on too much paid-for and voluntary work led him to suffer a mental breakdown. When he began to recover Tony dropped some of his commitments and streamlined his work to focus on web design and search marketing with his Mercia Web company, founded in 2006. In October 2009, when he was 55, Tony had a doctor’s appointment for a repeat prescription for high blood pressure medication. “The doctor was concerned about some routine test results, and biopsies confirmed I had multiple myeloma,” said Tony. “In January 2010 I was seen by the Royal Free Hospital in London, the only UK specialists for amyloidosis, who confirmed that I had that condition too. The combination is rare, with only 40 people a year getting both conditions. “Amyloidosis is also a condition of the bone marrow which usually affects people older than me. The abnormal protein cells that amyloidosis creates cannot be expelled by the body in the usual way so the body lays them down on organs. Everyone is affected differently.” In Tony’s case the rogue cells attached to his kidneys and heart, causing irreparable damage. His kidneys now function at only eight per cent of normal and his heart is permanently under stress, with its blood flow down to 50 per cent of normal. He said: “I felt panic and anger — why me? From feeling virtually normal I suddenly couldn’t keep awake and struggled to breathe. The slightest exertion brought on hyperventilation and my body began to swell.” In January 2010, Tony saw a haematologist at the Royal Derby Hospital who delivered the verdict that Tony had three months to live. “I chose to ignore that,” smiles Tony, a father of three and grandfather of four. “It wasn’t that I was scared of dying. I ‘died’ in 1974 in a motorbike accident in Burton. I hovered above the scene and was looking down at my body and the bike in the road and then I was aware of people behind me saying it wasn’t my time, and I went back. “But this time, in 2010, I knew I didn’t want to leave my wife, or leave my customers in the lurch. So I began to have sessions of Neuro Linguistic Programming (NLP) with a business contact called Dave Lees who ‘reprogrammed’ my brain.” NLP is a set of techniques that practitioners say can help harness the power of the mind to influence emotions and the body. Tony believes that NLP made it possible for him to fight for his life instead of giving in. It also ended his years of chronic depression. The first six months of chemotherapy did nothing to stem the cancer’s progress but there were remarkable results when Tony switched to a chemotherapy drug called Velcade. “My London consultant rang me at 9.45pm one night as he couldn’t wait to share how great the results were,” said Tony. “The treatment ended a month early because it had had such a great impact on the cancer.” These days Tony has learned to pace himself and relax outside work. Every night he hooks himself up to a home dialysis machine, which gets rid of the toxins and impurities that his devastated kidneys cannot handle, while he sleeps. A kidney transplant has been out of the question because of his cancer, but his progress means it’s now a possibility for the future. Tony and Ian Page met as fellow committee members of Burton Business Club. Tony was redeveloping the club’s website when he became ill. Ian — now chairman of the club — stepped in to help. This year could be a turning point for many fledgling businesses in and around Burton as, thanks to the campaigning efforts of Ian and the town’s MP Andrew Griffiths, some 30,000 homes and businesses are due to get superfast broadband. Ian said: “We see Burton as a place that will grow as a centre for business excellence and we want to be the first choice for fair, honest, noobligation advice and information on IT and web technologies. If people choose another company to do the work, armed with our advice, we don’t mind as long as their business grows and becomes more profitable and efficient.